Do Free-range Hens Lay Better Eggs? 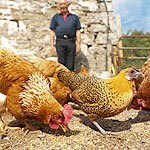 Home » Heart Health » Cholesterol » Do Better Hens Lay Better Eggs? The evidence increasingly shows that the best health advice for a morning meal is to include a few eggs. They are rich in nutrients, lower in cholesterol than previously thought, and help keep you satiated longer into the day. A new study addressed an interesting question: are eggs laid by free-range hens nutritionally superior to those laid by eggs in cages? Free-range eggs are generally perceived to be better for you. There is no doubt they are ethically the better option, and perhaps that is all that needs to be addressed. But since we deal with science here in Doctors Health Press, we’ll see if this natural food is actually clinically superior in nutrient base. To that end, the new study found basically no difference in quality of eggs produced by hens in both environments. What’s more is that cholesterol levels in all eggs were lower than U.S. officials had documented. This prompted the government to review and lower its estimates for average cholesterol levels in eggs. The main message here is that an egg, no matter where it’s produced, is a very nutritious food choice. Free-range eggs did have higher levels of total fat than eggs produced by caged hens, but they did not have higher levels of cholesterol. The researchers say that the most striking finding was that both cage- and range-produced eggs actually have lower cholesterol levels than previously believed. This in turn led the United States Department of Agriculture to lower the cholesterol guidelines for eggs to 185 milligrams per egg, down from 213 mg. In the study, egg samples were collected at 50, 62, and 74 weeks of age during the productive life of the flock and sent to four different laboratories. The results showed no influence of housing environment (range or cage) on levels of vitamin A or vitamin E. But, levels of beta-carotene were higher in the range eggs, which could be why their yolks are darker. This important carotenoid is very healthy, and is transformed into vitamin A in the body. Though there was more beta-carotene, the researchers concluded that overall there was no significant nutritional advantage of eggs produced by chickens given free range versus those in cages. All this said, if you support the more ethical treatment of animals, then the choice may be clear anyway. Free-range eggs just might cost an extra dollar.